Cosmos is Guardtime’s platform for building distributed applications and supporting them in production. It addresses many of the challenges of moving prototypes to production including data privacy, consent, compliance, enrolment and other non-functional enterprise requirements such as disaster recovery and security. In many enterprises today the answer tends to be that the marketing department wants to do a press release with “blockchain” in the title. This is certainly an answer, but hardly one that will lead to long-term value for the business. At Guardtime we are one of the few companies in the blockchain technology space that has the experience of working with a small set of initial clients, building a prototype, gathering feedback and then working with an ecosystem of clients to take that prototype into production. The first question we ask is what business problem are we trying to solve and more specifically what business process (internal or across organisational boundaries) are we trying to improve. A business (and government) can be defined by a set of processes. 50 years ago, every process in a business was manual and with digital transformation some of those business processes have started to digitize. Some of these processes are entirely within a single organization and some (most?) are shared across organizational boundaries. At Guardtime, we believe the goal of distributed applications should be to guarantee the integrity of those processes. The audit and reconciliation function in a business (internal and external) exists because there is no independent guarantee of the integrity of process. The compliance function exists because there is no way to enforce and prove the integrity of process. The security function exists because internal and external adverseries wish to circumvent the integrity of process. Trusted Third Parties exist because there is no way for organizations to verify the integrity of process outside their organizational boundaries. Hence the first step in implementing distributed applications is understanding process and the efficiency benefits of being able to guarantee and enforce process integrity. Blockchain and DLT technologies are just tools –only when they are packaged and productised in a practical way can they solve actual business problems. Which of the below figures most closely resembles your business process? If the answer is left then DLT platforms are likely to be a good choice. In our experience however many business process more closely resemble the figure on the right. Taking a technology designed to solve one problem (eg. cryptocurrency) and then assuming that it can be applied to other problems is the equivalent to having a hammer and thinking everything is a nail. The Guardtime Cosmos platform takes a different approach. The concept is called "federated execution and distributed verification" i.e. a process is broken down into its individual components and every actor in the process executes their part of the process (without sharing data) but everyone in the process can verify that others have executed their part of the process in accordance with pre-agreed rules (smart contracts). 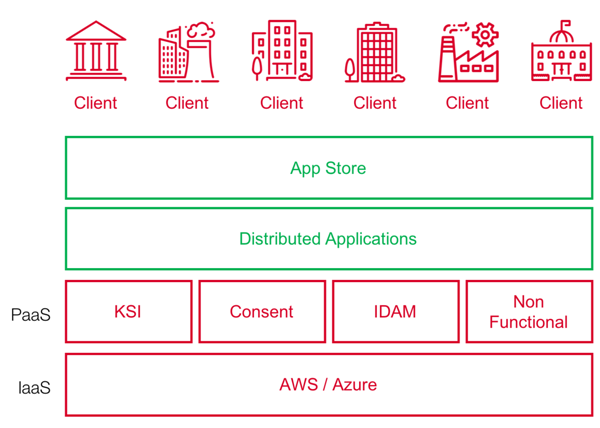 The Cosmos provides privacy by design, integrates with legacy systems, can scale and perform in line with enterprise requirements and is simple to deploy and manage without unnecessary complexity.